Wednesday 23rd November 2016 will be added to an already long list of landmark achievements for Mann Engineering as we have been officially awarded the Aerospace Accreditation AS9100. Our company celebrates its 40th anniversary this year and coincidentally we have been told we are now the 40th company to receive this award in Ireland. This Milestone award follows months of hard work from our team in documenting and where required upgrading systems and work practices, applicable to the highest standards set out by the worldwide Aerospace industry. The audit itself was carried out over a number of visits from our auditors NQA, culminating in the comprehensive Stage 2 audit which was carried out here over two days at the end of September. Mann Engineering becomes one of only a handful of companies in Ireland that have attained this prestigious accreditation. 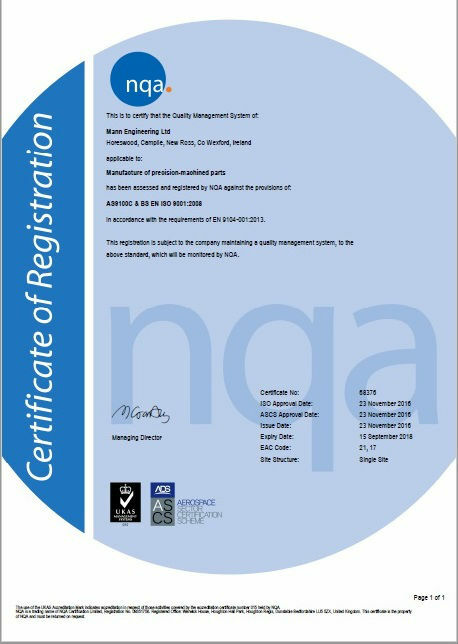 This means that from today, Mann Engineering will be entered onto the IAQG Online Aerospace Supplier Information System (OASIS database), so that companies worldwide can avail of our CNC Machining services, safe in the knowledge that as a company, our work practices, manufacturing processes and quality procedures conform to the highest standards as set out by the Aerospace industry globally. Reduced operating costs. Improvement of processes and operational efficiencies means money saved. Improved stakeholder relationships. Staff, customers and suppliers will respond well to positive change. Legal compliance. Understand how statutory and regulatory requirements impact the organization and its customers. Improved risk management. Greater consistency and traceability of products and services means problems are easier to avoid and rectify. Proven business credentials. Independent verification against a globally recognised industry standard speaks volumes. Access to large OEM’s. All companies registered to an Aerospace standard are listed in the OASIS database.